Imphal, Apr 22 : A Manipur Rifles personnel was killed and 17 others, including a superintending engineer and nine security personnel, were injured in separate explosions in Chandel and Imphal West districts of Manipur on Sunday, officials said. They said suspected insurgents ambushed an official team, including the superintending engineer and Manipur Rifles personnel of 8th Battalion escorting them, by exploding two bombs and opening fire at a place between Khudengtabi and Kwatha Lamkhai, about 110 km south-east of here, at around 7.45 am. An Army personnel, identified as Sushil Singh, was killed on the spot and 10 persons — six Manipur Rifles personnel and four civilians including the engineer — were injured by bomb splinters, sources said, adding the team was returning to Imphal from the border town of Moreh after inspecting the condition of some roads in the area. 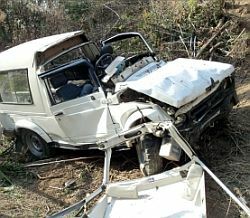 Official reports from Chandel district said the injured civilians included an assistant engineer and two drivers. All the injured were taken to a hospital in Imphal, they said, adding the condition of some of them was stated to be serious. Four hours later, suspected insurgents also exploded a powerful bomb attached to a vehicle at the roadside at Sekmai area in Imphal West district injuring three CRPF personnel and four civilians, sources said, adding that condition of the injured was not stated to be serious. No individual or group has claimed responsibility though the spots where the explosions took place were the operating zone of insurgents of different groups. The police said security and police forces rushed to both the spots after the explosions were reported and launched massive search operations by blocking all exit points. The insurgents, who reportedly exploded the bombs by using remote control device, escaped into the nearby thick jungles and hilly areas.